A couple of weeks ago I introduced our new Heavenly Homemaker’s Learning Zone where I offered a free “Fun With Grammar ~ Valentine Edition” Packet for 2-5 graders. 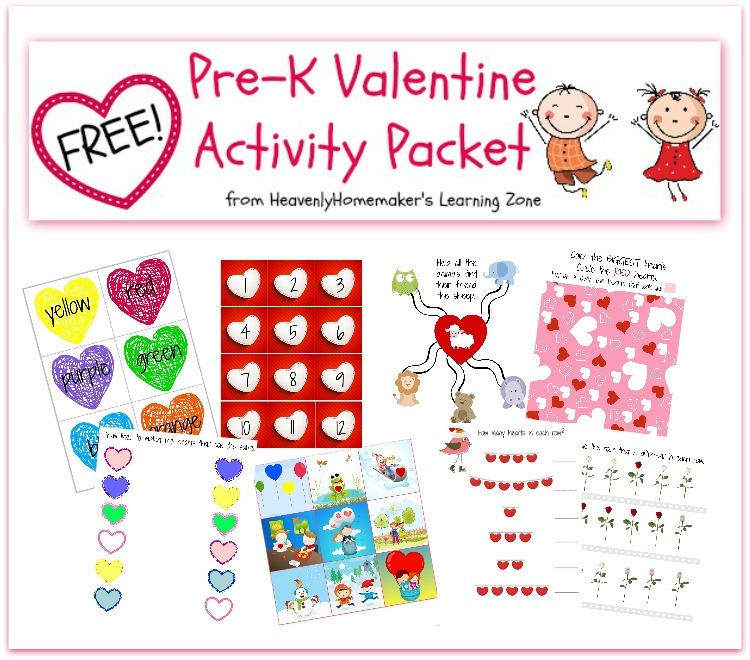 This week, we’ve got a FREE Valentine learning activity packet for younger kids! I’ve realized that I enjoy creating fun learning activities almost as much as I enjoy creating recipes! This new packet includes activities to help your younger kids practice color recognition, numbers and counting, same/different, big/small, and more. Pick and choose which activities your child(ren) would enjoy. It’s all FREE!! Click here to sign up. Easy as that! I’m super excited to share that signing up for these freebies will connect you to our new Heavenly Homemaker’s Learning Zone. It’s free, of course. You can unsubscribe at any time, your info will never be shared or sold, and being on this list means that you’ll be the first to know of the other fun (yes, FUN!) educational tools we’re putting together! Remember when I made the Merry Christmas Kiss-Tac-Toe printables? Several requested a Valentine’s Day version, which is such a great idea! Malachi and I decided that these are perfect packages to put together to distribute to all his friends at our homeschool Valentine Party! 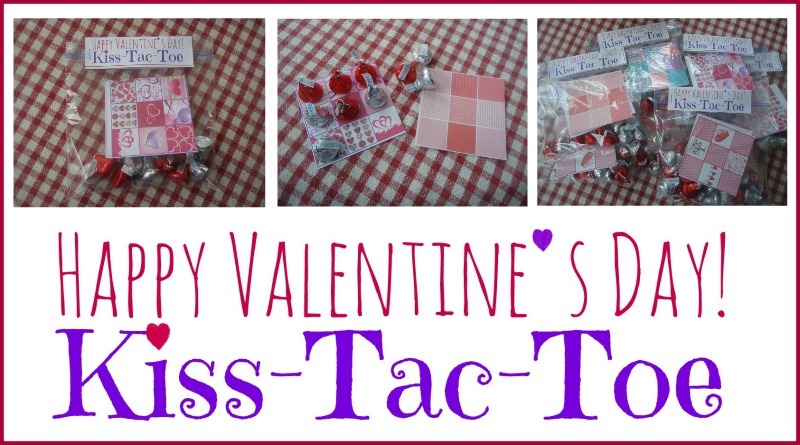 The download comes with four Valentine themed Kiss-Tac-Toe playing cards, printable instructions, and printable gift tags. Malachi and I printed, cut, and created an assembly line to baggie up the games to have them ready to give away. 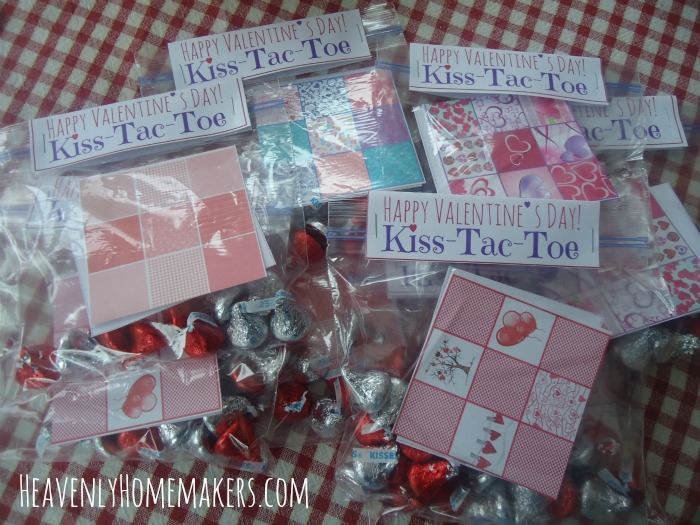 Each bag needs to include 10 Hershey Kisses – 5 each of two different colors. The Kisses are the playing pieces (instead of X’s and O’s). It’s deliciously fun (although harder to play once you’ve eaten the playing pieces). 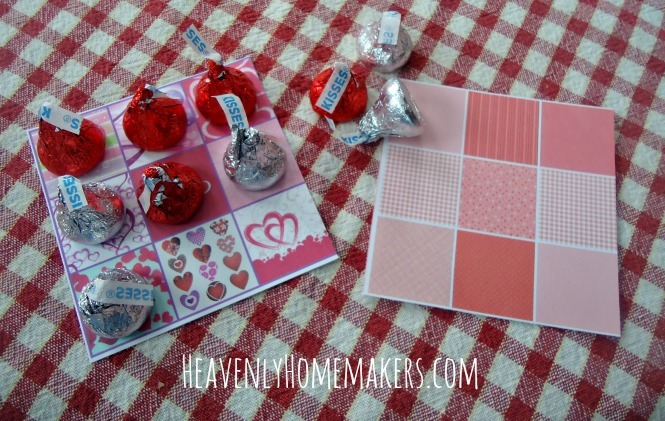 Download your FREE Happy Valentine’s Day Kiss-Tac-Toe Printables Here. Next week I’ll share some of our favorite recipes that are pink and red but free of artificial colors – perfect for celebrating Valentine’s Day! After I enter my email address and it sends me to your learning zone, I’m not actually able to download anything. When I click on things it’s just a picture and not a link. I’m specifically looking for the Valentine’s Tic Tac Toe. Thank you! Did you receive an email with subject line, “Welcome to Heavenly Homemaker’s Learning Zone!” If so, it will give you the page to download. Please let me know if you didn’t receive that email! Thanks for creating the Valentine’s board, it’s perfect for school parties! These are darling! Thank you so much for giving them to all of us. I haven’t been successful at getting them to download, tho…after I enter our E-mail address and hit “Enter,” it gives me an error message saying, “You are already subscribed.” I’ll ask you to help me, please, when you have time….oops! I just remembered this is your day of rest after your exhausting but delightful weekend. For that reason, please leave this until tomorrow. Also–we don’t even have the Hershey’s kisses yet, so can’t play it ’til tomorrow at the earliest. Sorry for the hassle! I added your email address manually – watch for an email asking you to confirm your account!